Your ERP system must adapt to the digital transformation – or you risk losing out on competitive differentials. Modern, cloud-based ERP systems present opportunities to get data quickly to the business user. And soon, that process will be automated, according to people who work closely with ERP systems. 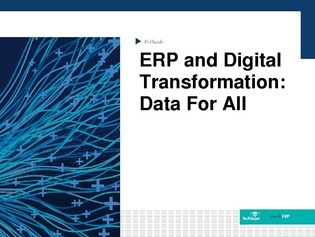 Download this expert guide to learn the other ERP trends for manufacturers digitizing their organization, and what problems ERP vendors still need to address.